Right from the beginning, Hackersoft really had no intentions on producing games in any size, shape or form, but for some reason things started to veer that way, and for a very short while, producing games seemed to be a very natural step to take. ASSISTED BY: Programmer Jon Wells who released a listing that allows you to tag on a BASIC program to a SEUCK designed game. PRODUCTION NOTES: This game was actually produced in two parts: using Sensible Software's 'Shoot Em Up Construct Kit', and BASIC. All the sprites were ripped from the original Commando game by Chris Butler and the scenery was drawn from scratch. This game only features one level and the rest remains unfinished. ASSISTED BY: The programmers of the original Software Projects game. PRODUCTION NOTES: Vinny Mainolfi of Hackersoft: "I recently read a 'making of' feature in Retro Gamer magazine on Jet Set Willy 2 and was inspired to go through the code and have a play with the rooms. This is my first attempt of working out the code for the room selection." 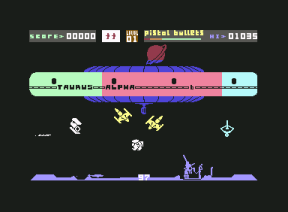 ASSISTED BY: Paul Clansey who is the original programmer of the game, Cosmic Cruiser. PRODUCTION NOTES: Vinny Mainolfi of Hackersoft: "I remember thinking how cool it would be to have Monty Mole as the main character in the game, Cosmic Cruiser. Whilst adding the new main character, the idea of saving Jet Set Willy jumped into my head, and so entered another popular character." PRODUCTION NOTES: This game was a joint venture that became an entry for the 1999 Commodore 64 Crap Game Competition. The original idea was conceived by Vinny Mainolfi, who contacted Frank Gasking to see if he was interested in producing the game. A formidable piece of work that was actually too good to win the competition. WAGGLE YOUR JOYSTICK LIKE MAD!